Home | Monday Tip-Off: Everything’s Coming Up THRILLHO! Monday Tip-Off: Everything’s Coming Up THRILLHO! We’re at midcourt, and the ball is about to go up…it’s Monday Tip-Off! Start your week here at the NLSC with a feature that’s dedicated to opinions, commentary, and other fun stuff related to NBA Live, NBA 2K, and other basketball video games. This week, I’m tipping things off with a highlight reel from NLSC THRILLHO’s season of 2K Pro-Am in NBA 2K17. When NBA 2K17 was released, the very first thing that Arcane, Kenny, The X, Valor, and I did was to play a game of 2K Pro-Am. We’d had a lot of fun with the mode in NBA 2K16, and having created our players in last year’s Prelude, we decided to jump right into the 2K Pro-Am experience. With the exception of a short break earlier this year, we’ve been enjoying some regular sessions over the past twelve months. However, as we discussed in last week’s Podcast, with this year’s Prelude and NBA 2K18 both right around the corner, we’ve been rapidly approaching the end of our season. On Saturday, we enjoyed a win that felt like a great game to end on. 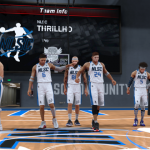 Through all the ups and downs, we’ve had some really fun times running with our NLSC THRILLHO squad in 2K Pro-Am. We’re still deciding whether we’ll keep the name for NBA 2K18, but in the meantime, I’ve put together an extended highlight reel of memorable moments where everything was definitely coming up THRILLHO! Check it out below, or catch it here on our YouTube channel. I hope you enjoyed the reel! If you’d care to check out some of our less spectacular moments, last December I put together a reel where it definitely seemed like nothing was coming up THRILLHO. Thanks to Arcane, Kenny, The X, Valor, and zzcoolj21 for being great teammates and a lot of fun to chat to and joke around with as we play. Here’s to more fun times NBA 2K18’s 2K Pro-Am, which of course is now part of The Neighborhood. Hopefully, the mode will be great from the moment we enter our name, THRILLHO or otherwise.